This is a straggly, spreading perennial or annual wildflower which grows commonly on railway tracks and embankments, on disturbed ground and grass verges. 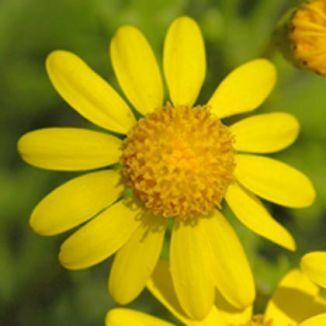 It grows to over 50cm high and from May to December it bears bright yellow daisy-like flowers (15-20mm across) in flat-topped, open clusters. The flowers have strap-shaped ray florets which encircle the disc florets. Behind the flower-heads are narrow, black-tipped bracts. The fleshy lower leaves are deeply pinnately lobed while the upper leaves clasp the stems. 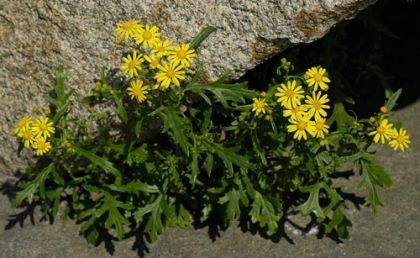 This is not a native plant and it belongs to the family Asteraceae. This plant spread to Ireland from Italy in the18th century and is now well established throughout. I recently found it growing under the platform of the DART station at Grand Canal in Dublin. During the Industrial Revolution, Oxford became a thriving railway centre and Oxford ragwort found a new habitat in the clinker beds of the railway lines that fanned out of Oxford to all parts of the country. These "furnished the plant with a replica of the lava-soils of its native home in Sicily", said Druce in his Flora of Oxfordshire. Referring to the fruits (achenes) of Oxford ragwort, he said 'I have seen them enter a railway-carriage window near Oxford and remain suspended in the air in the compartment until they found an exit at Tilehurst' (near Reading). Since that time, Oxford ragwort, which should not be confused with the common ragwort (Senecio jacobaea), the well-known irritation of pony owners, has spread to most parts of the UK, where it favours disturbed habitats such as building sites, roadsides and railway lines (you will see lots of its yellow daisy flowers if you take the Great Western line to Bristol any time from May to October).